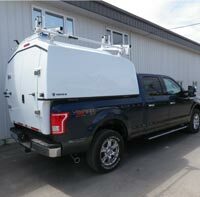 Master 75 - Transferable Fiberglass truck box - Walk standing inside. The Master 75 a self sufficient work environment allowing any job to get done at any given time and any given place. The Master 75 offers maximum space for any work application, with a wide range of options, the Master 75 is sure to answer your needs. 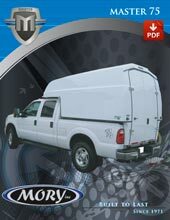 Master fiberglass truck Bodies insert onto fleet pickup trucks and are a replacement for a van, SUV’s when ordered with the specific shim kit and an excellent secure upgrade from truck toppers. 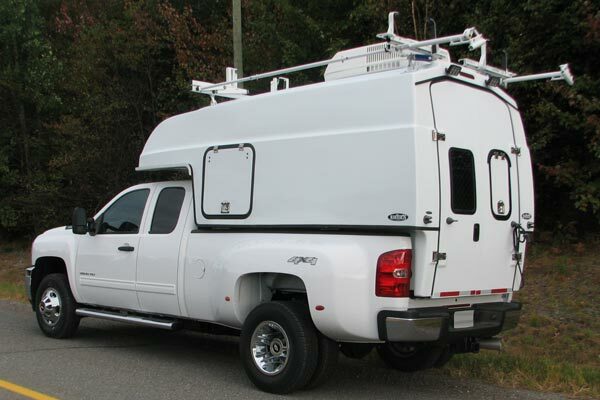 Master is self-contained and is a universal fit for all full-sized domestic trucks. 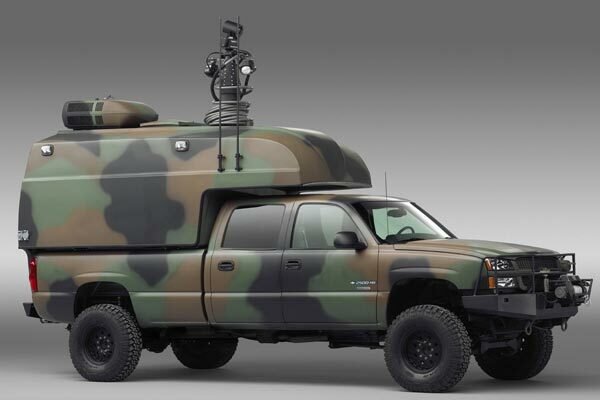 With our patented lockdown system, you can install or remove the body from your truck within 15 minutes if you need to switch vehicles, take your truck into be serviced or replace your truck. The Master is a fully enclosed capsule so all your tools or equipment will stay safe and secure. 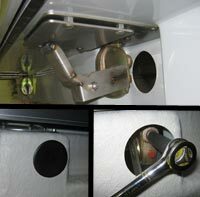 Universal truck body insert installs on all standard trucks with 6.5 and 8’ box (Ford, GM, Dodge and Toyota). Walk and Stand, move comfortably with 74” of head space. 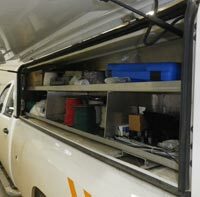 Exceptional storage space both in the main body and overhang. Ideal for site location where the job will last a week or months simply remove the M75 leave it sitting on the HD Jack stands or the storage stand and you now have a secure office and or tool shed. No need to tow a trailer, because you will have everything in the Master. Its added value to your fleet reduces the costs associated with the transfer of equipment that is lost with changing vans. 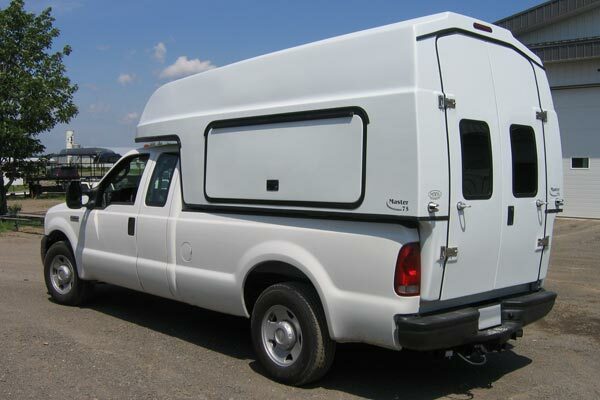 When installed on a crew cab carry up to 6 workers and their tools. You can’t do that with a Van. Master 75 configured to a Mobile Office is the ideal choice for busy site Supervisors or Managers that have to move between locations. 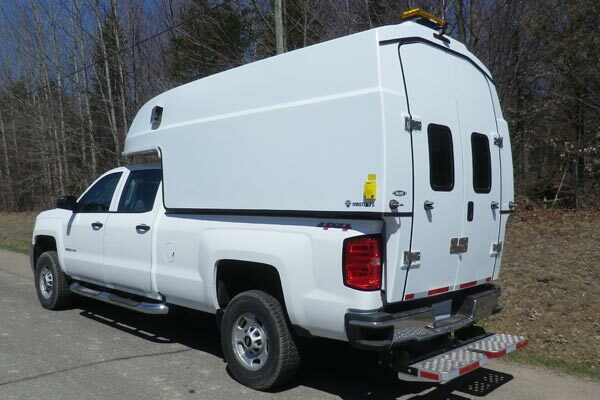 Master fiberglass truck Bodies insert onto fleet pickup trucks and are a replacement for a Standard and High roof cargo Van, SUV’s when ordered with the specific shim kit and an excellent secure upgrade from truck toppers. Master is self-contained and is a universal fit for all full-sized domestic trucks. 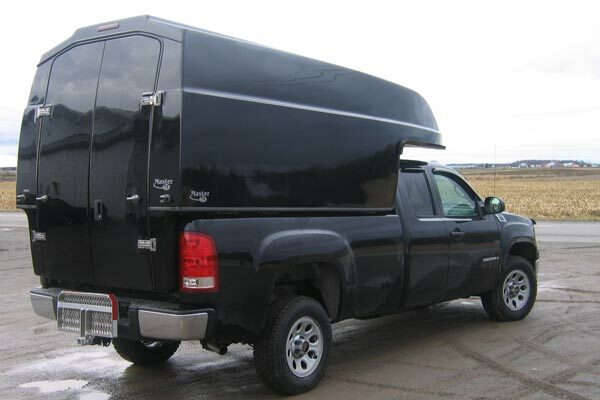 With our patented lockdown system, you can install or remove the body from your truck within 15 minutes if you need to switch vehicles, take your truck into be serviced or replace your truck. The Master is a fully enclosed capsule so all your tools or equipment will stay safe and secure. 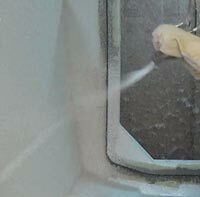 Fiberglass Construction. Much lighter than aluminum or steel. Save on gas and has less wear on your truck!